2 Sm zucchini, sliced diag. Note: In lieu of parboiling, the vegetables can be sautéed in olive oil until tender-crisp, if desired. *Note: Bell peppers should be cut in strips. 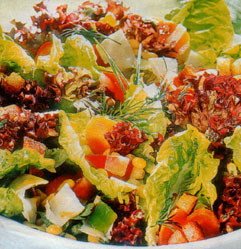 (**Bibb lettuce may be used instead of arugula. ***Red leaf lettuce should be sliced. Cut corn kernels from cobs into bowl. Set aside. Bring 2 quarts salted water to rolling boil. Drop pepper strips into boiling water. Parboil 1 minute or until color heightens. Remove peppers with slotted spoon and drain. Refresh in bowl of cold water. Set aside. Add yellow squash, zucchini and eggplants to boiling water. Parboil 2 minutes. Remove with slotted spoon and drain. Set aside. Toss basil with arugula and red leaf lettuce. Arrange greens on large, shallow platter or tray. In large bowl stir to combine vinegar, walnut oil and salt and pepper to taste. Add corn kernels to dressing, toss and drain, reserving dressing. Arrange kernels in spoke pattern to resemble sun rays over greens, mounding some in center. Separately add peppers, squash, zucchini and eggplant to dressing, tossing lightly. Arrange red, green and yellow vegetables in sections between corn kernel spokes. Pour any remaining dressing over salad.